If you’re looking for a slightly unusual salad for a pot-luck, try this Lentil Salad with Green Olives, Red Bell Pepper, Green Onion, and Greek Oregano. Use the Diet-Type Index to find more recipes like this one. Click here to PIN this Lentil Salad with Green Olives! Last night I got home from Chicago, where I had fun attending Eat Write Retreat, hanging out with my friend Stephanie, eating at some favorite spots like Greek Islands and Frontera Grill, and meeting some food bloggers that I’d known online but hadn’t met in person. While I was gone Salt Lake has been having a heat wave, with temperatures hovering around 100F for a few days now, so cold dishes like this Lentil Salad with Green Olives, Red Bell Pepper, Green Onion, and Herbs are sounding good! My love for brown lentils is well documented on the blog, and this lentil salad recipe started with an idea that popped into my head to combine brown lentils and green olives, a combination I loved. Then I was inspired to add a generous amount of chopped red bell pepper plus Greek oregano and fresh Italian parsley from my garden, fresh ingredients that I really thought added an interesting twist to the salad. Lentils are something I consider a “good carb,” but if you want to make the salad lower in carbs, I’d suggest using more red pepper and green onion and reducing the amount of lentils, for a lower-carb meatless salad that will be just as delicious. I think this vegan and gluten-free salad would make a great salad option for a Fourth of July barbecue or picnic; hope you enjoy. 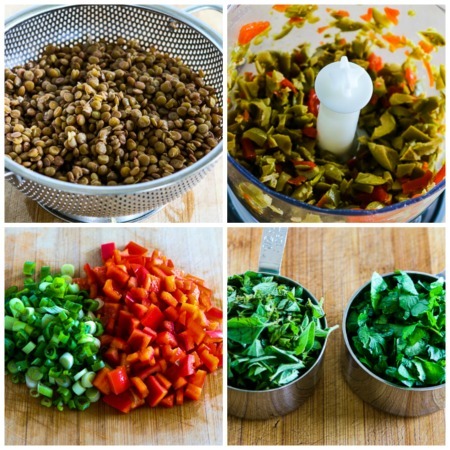 Drain the lentils well while you slice the green onions and chop the green olives red pepper, and herbs. I used a jar of green olives with pimento, and after I drained them I used the bowl attachment of my immersion blender to get coarsely chopped olives and pimento pieces. As soon as the lentils are drained well, combine one tablespoon each of lemon juice, balsamic vinegar, and olive oil and marinate the warm lentils in this mixture. Whisk together the rest of the lemon juice, balsamic vinegar, sweet paprika, and Spike Seasoning; then whisk in olive oil to make the dressing for the salad. Combine the lentils, chopped red pepper, green onion, and green olives with the desired amount of dressing, and gently stir in the chopped herbs. Season salad with salt and fresh ground black pepper and serve salad cold or room temperature. This will keep in the fridge for a day or two, although I like it best when the fresh ingredients are still crunchy. If you’re looking for a slightly unusual salad for a pot-luck, try this Lentil Salad with Green Olives, Red Bell Pepper, Green Onion, and Greek Oregano. Dump lentils into a colander and let drain about 15 minutes, then toss with 1 t each of olive oil, fresh lemon juice, and balsamic vinegar. Let lentils marinate in this mixture while you prepare other ingredients. (If you have plenty of time, marinate the lentils 20-30 minutes, but even a few minutes of marinating will add to the flavor. Chop red bell pepper and green onions and place in medium-sized plastic or glass bowl. Finely chop the Greek Oregano and Italian parsley. Mix together remaining 1 T lemon juice, 1 T balsamic vinegar, Spike Seasoning, and sweet paprika, then whisk in 3 T olive oil. Gently stir the chopped herbs into the salad. Season to taste with salt and fresh ground black pepper. This will keep in the refrigerator for a few days, although I like it best when the fresh ingredients still have a little crunch. 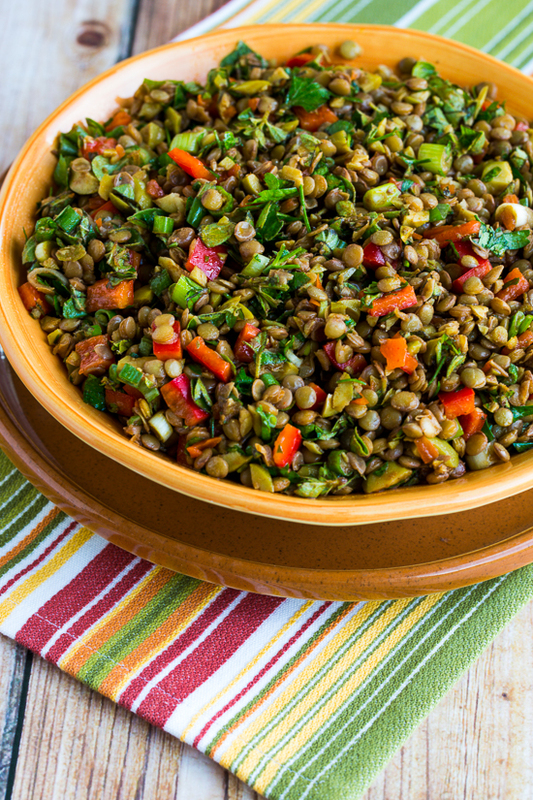 Lentils are considered a “good carb” for the South Beach Diet, and you could eat a small serving of this lentil salad for any phase of the diet. To make this a lower-carb salad, decrease the amount of lentils and use more chopped red pepper and sliced green onion. Great updating of the photos this time! The new photos really make this salad pop. Thanks Lydia! I was always so unhappy with those old photos. This is the 100mm IS Macros lens; I'm finally getting the hang of it! I'm fascinated by your flavouring for this recipe, Kalyn. Could you please provide a Canadian alternative for the Spike Seasoning? I'd be surprised if you can't get Spike in Canada; I know you can order it from Amazon.com. But it's an all-purpose seasoning blend with lots of ingredients. I don't think there's anything else that's quite like it, but any all-purpose blend you like can be used instead. I'm intrigued by the flavor combo in this salad. Sounds amazing! Thanks Mike; I love all these flavors! Love Lentils this recipe sounds great, never used Greek Oregano, must look out for it and give it a try. Another super tasty and healthy salad! I can never get enough of them. Tigerfish, if I was on the ball I would save the lentil cooking liquid and freeze to use later in making vegetable stock, but I threw it away this time. How do you make use of the drained liquid after cooking the lentils? Maggie, so glad you liked it! Thanks for letting me know. I made this salad yesterday to have for lunches. It is very very good! I haven’t been a fan of green olives before, but this is a terrific combination. I overcooked the lentils a bit since mine are quite fresh, and it is still delish! It really soaks up the tasty dressing. My alterations were adding 1 roasted red pepper and using some salt and dried herbs since I don’t have Spike seasoning at hand. Great way to use lots of fresh Greek oregano. Thanks again for the recipe! Bee, I’ve got to try making mujadara myself. I absolutely love it! Best tasting thing in the world. Peter, thanks. Wish we were having outdoor meals around here. Decks need to get done first! Michelle, thanks so much. Comments like that really make my day. I am a big fan of lentils – I’ve never seen a recipe with green olives before. I’m an even bigger fan of green olives so I’ll have to try this combination. Kalyn, as someone new to South Beach, I want to express my gratitude for your marvelous blog. The info, recipes, and pictures you provide have really helped me love this new way of life. I have already lost 10 pounds and look forward to eating all this wonderful food as I shed the rest of my weight. Congratulations on your continued success. I look forward to reading your blog regularly. Kalyn, this screams to be served at an outdoor meal and for sure at a picnic…my Greek tummy’s singing. What a beautiful salad you made. I could eat lentils almost every day. just ate some fabulous mujaddara. i love your version of lentils. and the clay pot. I’m not keeping up on these comments too well, but I’m glad people are liking this. Maggie, I love Mazza and eat there all the time. I also have a Greek oragano plant in my yard (I’m also in SLC, oragano loves Utah, perhaps?) and am looking forward to trying your fab salad with it. Cafe Mediterranean may be gone, but you can get Mujaddara and other yummy Middle Eastern dishes at the two Mazzas restaurants in Salt Lake. Thinking of their food makes me swoon, it is so good! Just discovered your fantastic blog! Love the idea of using oregano fresh – I’ve got a really healthy plant in the garden and would like to try out recipes that incorporate these herbs. I love lentils. I don’t eat them enough. I will be trying this salad for sure! This salad looks fabulous – I love the addition of the green olives. I always tell myself that I’m going to cook more with lentils, but never actually do it. This salad on going on my must-try list. Oh my. What a beautiful creation. I just love the idea of pairing green olives with lentils. I have never cooked with lentils, but this recipe definitely inspires me to do so! Can’t wait to try! I love lentils, they are definitely one of my favorite legumes and were the first ones I ever cooked myself. I have some green olives sitting in the fridge waiting to be used up so I think I shall have to make this, perhaps with some pitas for lunch. Pearl, thanks. It was unusual, but I really liked it. Vanielje, I think sun-dried tomatoes, lentils, and oregano sounds like a great combination! Tanna, aren’t they just such a natural in so many dishes. Lydia, I wish I could send you some! My plants are thriving. Penny, it’s probably Greek Oregano; I think that’s the kind most commonly grown. Meghan, it’s a strong flavor. Oregano is the main flavor in pizza sauce, and oregano is great with tomatoes. This is an unusual use of it, but I liked it a lot! I have a bag of lentils that I bought because I wanted to try them and I’ve been waiting for a good recipe. This salad is so vibrantly colored! I’ve never had Greek Oregano before. I love lentils too. I have a huge patch of oregano in my herb garden – don’t know the genus, but I’m sure it would work. Will give this a try. Thanks. Lentils and olives? I’d never have thought of it. But now I’m more disappointed than ever that my Greek oregano didn’t winter over in my herb garden. I’m planning to put in a new plant or two this year, and will bookmark this recipe to try. I do that to … lentils come to mind often. I think I use them a lot almost as meat in many dishes. This looks great for a salad with grilled summer foods. Looks devine Kalyn. I love Greek oreganum, but I normally add sundried tomatoes to my lentil and oreganum salad. Will have to try yours out. 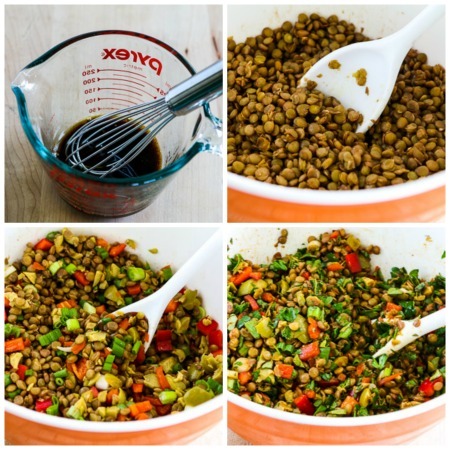 Kalyn – your lentil salad looks yum!